A three day SGA for My Home Industries Limited, Telangana was organized during 15th to 17th June, 2017. 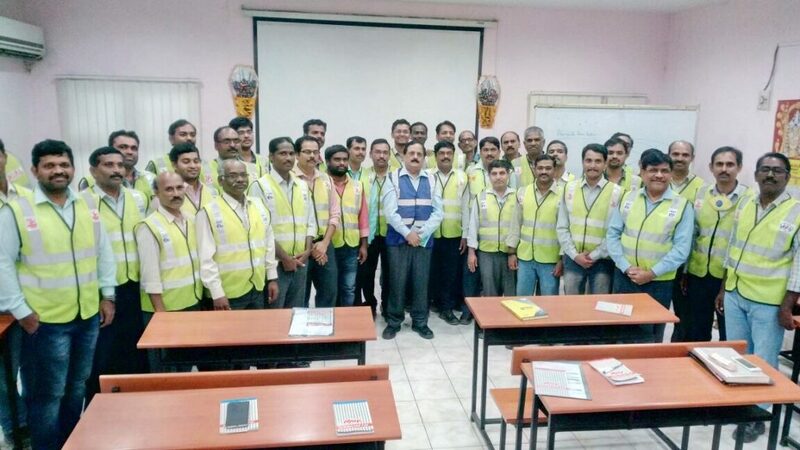 The SGA for My Home Industries Limited, Telangana was designed to ensure that employees from all levels of production participated and went through a series of guided/ facilitated process that included self-assessment, listing of options, and assessment of options on their relative economics and impact and prioritization of actions most suited to meet the energy efficiency requirement of their specific area of plant operation. 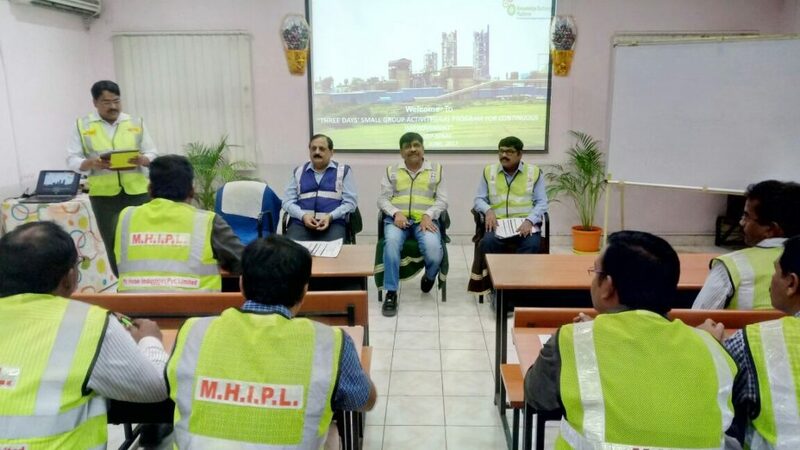 These sessions were carefully facilitates so that the employees work as a team in coordinated fashion and there is a healthy competition within and across groups in different operational areas. The workshop was inaugurated by Shri MM Patil, President (Works), My Home Industries Limited. In his inaugural address, Shri Patil brought out the importance of Small Group Activity. He mentioned that energy savings in the industry can be achieved through technological option, but sustaining these savings, the industry would require involvement of all employees. Besides, there are many areas in which potential for energy savings exists and plant needs to harness the same. He hoped that SGA will be helpful to strengthen the skills of employees and they will take up assignments by putting their efforts for reducing energy consumption in their respective Departments. A brief outline of the Small Group Activity for My Home Industries Limited, was given by Shri K K Chakarvarti, Expert Consultant. Shri Chakarvarti provided a brief overview on SGA activities and its objectives along with an overview on electrical and thermal saving possibilities at the plant level. He mentioned that while SGA has tremendous potential in helping a plant realize its productivity and efficiency targets, the onus of its success was with the employees at the operational level. He emphasized that the SGA needs to work as a team and identify innovative approaches through change in practice, technology, approaches to enhance the efficiency of the plant in their area of operation, reduce energy use and minimize wastage. He clarified that in doing SGA, the burden of employees doesn’t increase but infact helps them in improving their productivity, boosting their knowledge and confidence, team building and communication. Each group comprised of 5-7 engineers. The engineers working in various departments viz. Mechanical, Electrical, Instrumentation, Quality Assurance, Process, Packing Plant and Captive Power Plant were part of these groups. These Groups were given the additional input of identifying the energy saving areas in the process, electrical and thermal areas. This session was attended by plant top management, including Shri MM Patil, President (Works), My Home Industries Limited and various Plant Heads. Shri Chakarvarti informed the plant management that SGA has resulted in great enthusiasm among the group members and to find out the solutions and steps to achieve energy efficiency development. 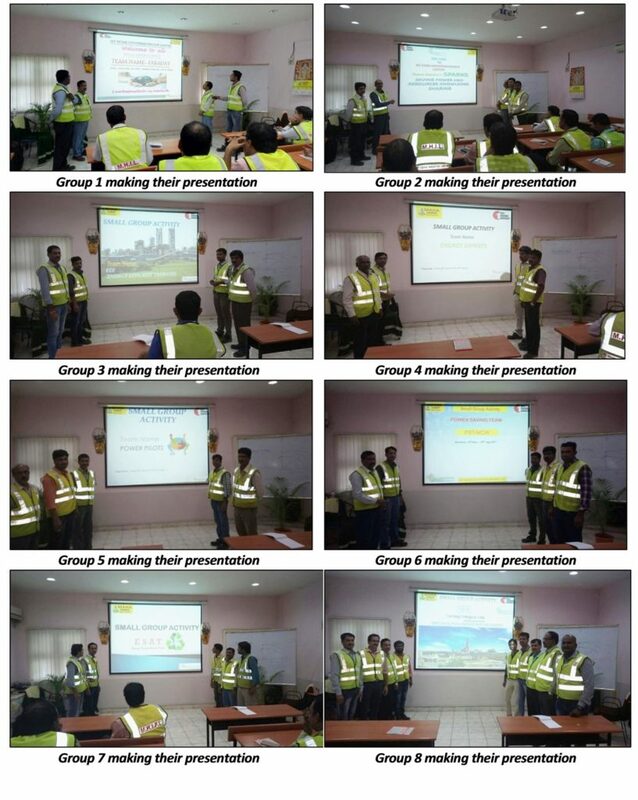 In total 365 kW and 7 kcal/kg clinker energy saving target was planned by 9 Groups. Plant engineers could identify the power saving potential of about 365 kW with the help of knowledge gained in SGA and brain storming. SGAs proposals have well explained the operational improvements avenue. In his concluding remarks, Shri MM Patil said that most of the identified projects involves very low cost can be implemented in a very short period. Involvement of employees can bring a lot of improvement in plant efficiency. He advised the engineers to continue the initiative and achieve what has been planned during SGA program. He also urged that all participants to share knowledge with other colleagues of the company as well. Shri MM Patil thanked the top management in supporting this initiative and also KEP for sharing the knowledge. The SGA’s will now prepare a detailed action plan for implementing the projects identified by their groups, the progress of which will be reviewed by the Management of My Home Industries Limited and KEP at the end of 2 months. After this mid-term assessment, the final assessment will be carried out by the plant at the end of the implementation period to evaluate the relative performance of each group in terms of achieving their objects and energy saving targets proposed by them. To encourage the team members, My Home Industries Limited may also institute a reward system to recognize the best achievers.